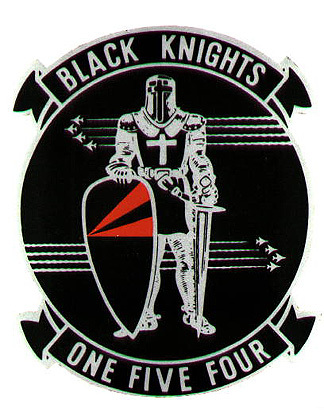 The Black Knights called into Freemantle, Australia, on the 11th of April 1997, having just completed particpation in the exercise 'Tandem Thrust'. With VF-154's F-14A's severely showing their age the squadron 'swopped' six of its worst airframes for six from VF-213, which had visited onboard the USS Kitty Hawk (CV-63), a few weeks earlier. The table below reflects these changes. VF-154's markings have tended to be low key. When their F-14's were first delivered they featured three stripes running from the lower front to the upper back of the outside surfaces of the stabilators. At first the upper and lower ones were black, with the middle orange. An image of this scheme can be seen below. As markings became even more toned down the orange coloured stripe was removed. It now seems to have been replaced by a medieval shield design, featuring a vertical sword.